Do you find that the longer it takes you to read a book, the harder it becomes to pick it up and start? Some of you might have noticed that I’ve been referencing Richard Olney a lot recently. 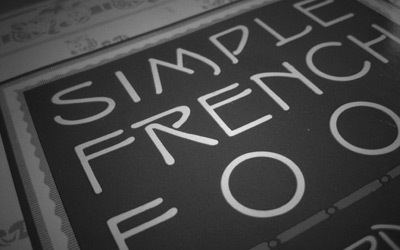 The truth is I’ve had his book Simple French Food for almost 15 years, collecting dust on my bookshelves all this time. I picked it up right after college when I decided to learn to cook, out of a sense of associated loyalty. Olney and my father (an editor) worked together on the Time Life Good Cook series, but I was very young at the time and did not meet him. So novice-me bought the book and was intimidated right off the bat. I scurried back to the familiarity and ease of my Julia Child, and kept this one on the shelves. Fast forward to a month ago, when I picked it up in earnest. What a change! All of a sudden, it wasn’t scary anymore. Quite the contrary, to the older, more experienced me, this book is brilliant, accessible and often funny. A book like this does not go out of style. I read it basically cover to cover, and was quite inspired. I like that Olney often explains his reasoning and purpose behind a decision, rather than just dumping out some ingredients and assembly instructions. Verdict: an oldie but very goodie. P.S. Another book of Olney’s that I love, and which has not collected so much unjustified dust, is Lulu’s Provençal Table. Readers of Orangette all know that Molly Wizenberg can write. Her new book, A Homemade Life, is personal and touching and clever, with words that reflect the soft-focus photographs found on her blog that synthesize honesty and beauty in such an interesting way. 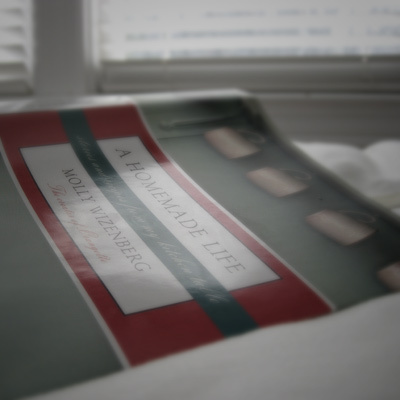 The book is a series of delightful vignettes that align biographical anecdotes with recipes. While her stories are interesting and her recall of charming details is impressive, it is really the shape and rhythm and choice of words that won me over so completely. Molly is willing to bare her humanity, and is as unashamed to write about her quirks and crushes as how much she loves her parents. She is not trying to be cool, and you adore her for it. She gives the reader a heartwarming lense into her life, very different from the “can’t look away from the car wreck” titillation so popular in modern tell-all books and reality shows. Her narrative voice is youthful, but not naive nor saccharine. Above all, you see how much she loves food (in particular, cake — she’s big into cake). We both love comfort food, and while Orangette tends towards the baking/dessert side of things, and I steer towards savory, there are still quite a few recipes in this book that I am looking forward to trying, all clearly explained. As is most obvious, I recommend the book very highly. I hope you are as delighted as I was. 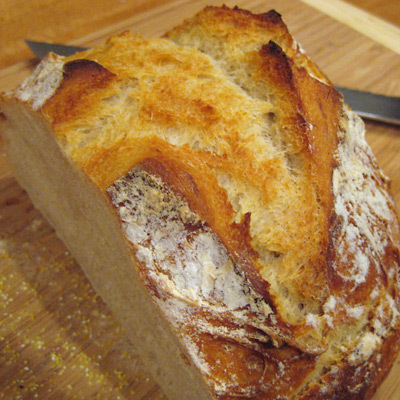 Artisan Bread in Five Minutes a Day, by Jeff Hertzberg and Zoe Francois, came out about a year ago and positive reviews have been percolating around the blogosphere for some time. Recently, I decided to pick up the book and try my hand. First of all, other than making pate brisee for savory pastry dishes, I have historically not enjoyed baking at all. I’m a cook rather than a baker (Lisl usually does all the baking in our household). So with that context, I’ll come out and say that I am really happy with this book. The process is extremely easy and the results delicious. We have tried making bread purely in a breadmaker, doing a combo breadmaker-oven approach, the no-knead method Bittman wrote about long ago, and now this. This is my favorite method so far combining ease and flavor, and I look forward to exploring the Artisan book further. The instructions are easy and clear (and make sure you read them!). You might also check out the corrections they have posted on their website. 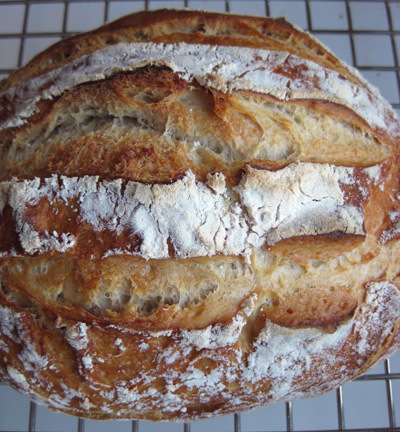 Two notes from authors: before you bake, let the dough (however you shape it) rest for at least 40 minutes (I did 40 minutes on the dot and results were great), and slash the top of the dough right before you put it in the oven. I would be well into my third batch of dough if I hadn’t broken my baking stone by pouring water on it when it was really hot (the water was intended for the broiling pan on the rack below… fumble fingers!). I would actually mix up double the size of the basic recipe if I had more room in my fridge, but I don’t think I can squeeze bigger than a 5.5 quart bowl in there. Lastly, I’ll note that one of the authors, Zoe Francois, has a great blog at Zoe Bakes and there is an official book blog here. Watching Zoe interact on Twitter was the clincher in my deciding to get the book (not that reviews haven’t been great but, again, I usually don’t bake). It is wonderful to see people who want to be part of the community, rather than just pitch something at the community. An increasing amount of the latter exists on Twitter (and all social media really), and I have no time or interest in such behavior. So I tip my hat to you Zoe, and thank you and Jeff for creating such a wonderful book. Update P.S. as I was writing this, Peter over at Kalofagas was trying out this book as well and twittering his progress. He sounded as positive as I am. We just got our copy of David Tanis’ new book A Platter of Figs, and I’m in love. I try not to fall for all the new pretties, but this one has hit home. Tanis is the chef at Alice Waters’ Chez Panisse for 6 months of the year and he has written a gorgeous, completely unpretentious book. Aw shucks Tanis, you had me at “peasant”. In Platter of Figs, Tanis takes a moment to describe his past, but he’s not trying to impress you with credentials, nor do you sniff false humility. I loved reading about how Alice Waters pretended not to hear him when he, hanging around as a young man, asked for a job over and over until one day the Panisse baker left to get married. This book, organized by seasonal menus rather than food category, just oozes love of good food and good company. It is Tanis’ philosophy that really gets me, such as his love for beautiful rather than pretty food; the natural over the gussied-up. Granted that we all live busy lives, but I revel in my time in the kitchen. It is a chance to step outside the intensity of the work world and let the creative mind roam free. With it comes that timeless pleasure of sharing a meal with a loved one, or a group of friends. Of course work and stresses intrude and often supersede, but nonetheless, the food experience provides a target worth pursuing and a delightful canvas on which to paint. While I love that chefs today get a chance to emerge from behind the curtain to applause, I’ll admit that I’m a bit sick of the “celebrity chef”. I do not watch food television, both because of limited time and because I don’t find many of the “personalities” appealing, each with his or her own shtick targeting a particular viewer type (the bubbly, the geeky, the down-home country, the kitchen terror, etc). However I should not generalize, for my distaste does not apply to all (probably quite the contrary). As an example of something I really enjoy, I’ll mention the Eric Ripert’s toaster video pieces (link). The man is a culinary genius but he is utterly real and charming in these little spots. I digress (how unusual, Giff). Christ, now he’s talking to himself. The POINT is that I found Tanis’ cookbook both delightful and inspiring. 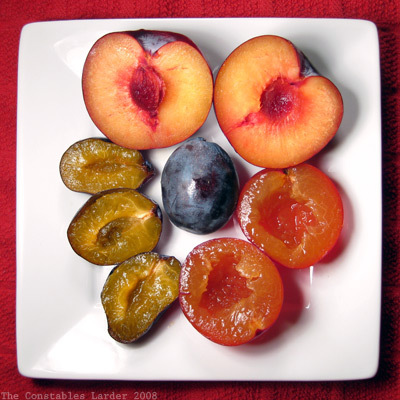 As for my own touch to this little post, I may not have a platter of figs to share, but I can leave you with a plate of plums. Consider it an homage to fading summer, in a melody of black, alderman and prune. And yes, I devoured them all in one sitting! 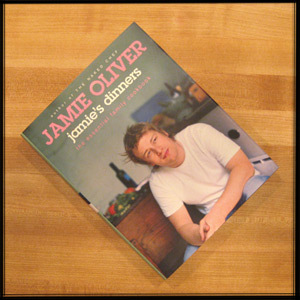 I’m a huge fan of Jamie Oliver’s cooking style. He cooks wonderful but totally unpretentious meals. In the immortal words of Dennis Denuto, it’s the vibe of the thing. Some cookbooks are so complicated that it is hard to free-form with a recipe or simplify to speed the process, but not Jamie’s. I recently picked his “family cookbook” and now have a slew of recipes to take apart. While I have my eye on a Pumpkin Laksa soup, I think in this heat my prime target is the Thai Watermelon Salad, which is a combination of watermelon, cilantro, arugula (i.e. rocket), mint, radish, sunflower seeds (or peanuts), and feta, with a dressing that is a classic mix of ginger, chilis, soy sauce, sesame oil, limes, and olive oil. I think that’s definitely on the menu for next Saturday lunch. Since Audrey is clamoring for watermelon at breakfast, lunch and dinner, we definitely have some around!